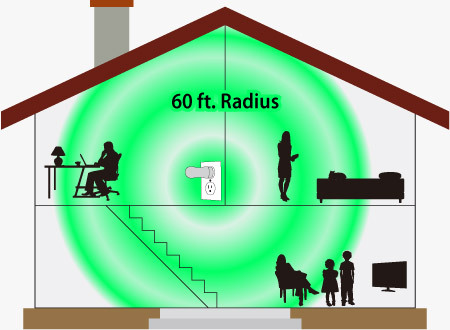 Dual Action Technology - designed to stress reduction and energy enhancement in your home and office. Q. What are the directions for using the Home Harmonizer? A. Simply plug the Home Harmonizer into the centrally located wall socket in your home or office environment. Q. What room/area should I plug the Home Harmonizer in? A. The Home Harmonizer harmonizes the electric current and circuit in which it is plugged into, thus we suggest plugging it into a central located socket. The Home Harmonizer spreads a balancing yet invigorating subtle energy field that has a radius of 60 feet. If there is a room or office in which you spend a lot of time, we highly suggest using one Home Harmonizer specifically in that room. Q. Does the 60 foot radius travel in all directions? Can it go upstairs/downstairs? A. The 60-foot radius travels in all directions. It travels through ceilings, floors and walls between bedrooms. Q. If the Home Harmonizer is plugged into a certain room, do the electronic devices/machinery in the room need the BIOPRO Universal Chips on them? A. Yes, the EMF-emitting devices in any of your rooms need the BIOPRO Universal Chips on them. The Home Harmonizer harmonizes the electrical currents that run through your home/office, but the electrical appliances need the BIOPRO Universal Chips specifically on them for the best preventative measures in protecting your body from negative effects of the electrical magnetic frequencies. Click the button below to add the Home Harmonizer New to your wish list.